Another stash of some lifestyle/makeup fun! Essie polish is fabulous. Love the color! This polish pretty much makes the whole box worth it - it's usually $8 so well worth it. The Jouer, lip enhancer is also great because there is no color. Love lip products that don't have crazy colors. I'm pretty happy with the body moisturizer as well. The smell isn't too great but definitely moisturizes. I'm not too thrilled with the sunscreen. Sunscreen is sunscreen, isn't it? I am super excited to try the Kusmi tea - I love finding new delicious teas. I'm always nervous to try new face cleanser...my skin tends to be sensitive and I'm always nervous it'll cause me to breakout! Thoughts: This was a pretty okay Birchbox. If it wasn't for the Essie, I wouldn't have been a happy camper - at all! The polish saved it. I am happy about the lip enhancer and moisturizer but doesn't take over the box like the polish does! Like I said earlier, I'm a huge lip gloss lover. But the color of this Lip Bomb Glossy Stain is horrible. I tried wearing it and it completely washed me out. I wish it looked good - it seemed like it would last a long time. Ohmygosh. The Be a Bombshell Eye Liner is just WONDERFUL! It is a marker-like tip and so easy to put on. I am so happy with this. I think that this eye liner is well worth the whole bag! I love finding new mascara that I like...theBalm mascara is pretty great. I'm excited to try the Perquil Oil Treatment. With my frizz ball hair, I need some type of treatment to help tame my frizz. So far, it seems to work. The smell is pretty good too. New eye shadow makes me iffy - especially since I'm a happy camper with my TooFaced palette. I have yet to use the Coastal Scents Eye Shadow - when I do, I'll let you know how it is! This makeup bag is just wonderful, isn't it? 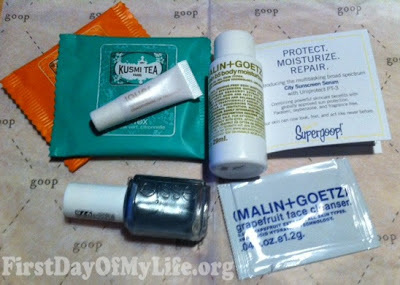 My Thoughts: Again - ipsy outranks Birchbox this month for me! I totally unsubscribed to Ipsy after I got my bag:( Need to write my review pronto. Too many dark colors for this pale girl, and I got purple eye shadow. But I do love the bag! I got a completely different birchbox too! The teas sound delicious. I love trying different new teas too. How are you doing, my sweet friend? I hope you are enjoying the Fall days. If you want to see the Red Rose Alley girls, Nel did a wedding post. It's the first time that we put pictures of us on there. You can finally see your look alike, only a little older hehe. I LOVED this Ipsy bag. I was so excited by it! The gloss worked really well with my skin tone so I was very happy. It does last a long time. I saw the retail price is $40 though!